The brights of the Marina Bay Street circuit come alive when Formula 1’s only night time race of the season comes around. Twisting and turning through the backdrop of Singapore’s super stylish and visually stunning landscapes, this race provides drivers with a challenge unlike any other they face throughout the year. The proximity of Singapore to Australia also means that the scheduling of this race makes it easier to get up the following morning. The longest track on the Formula 1 calendar, Spa is set in the hills of Ardennes Forest. Visually stunning for fans and drivers alike, the track is a highly technical and physically demanding course. A massive 7km of sprawling track famous for its changes in elevation, Spa is also notorious for it’s challenging weather conditions. While the weather is known to change condition very quickly (something we Melbournites can appreciate), the size and scale of the track can cause headaches when we see half of the track running dry with the other half in heavy rain. These types of conditions can cause nightmares for drivers and their teams, as was evident during a manic qualifying session in the 2018 edition of the great race. Albert Park is the inspiration for one of our tracks at Race Party. If there was ever any doubt about the place of the Austin based United States Grand Prix on the Formula 1 calendar, the 2016 deal that saw Liberty Media take over the reigns of Formula 1 cemented it as a jewel in the sport’s crown and key marketing piece in cracking into the US market. While the race itself has always been a highly competitive and entertaining affair, the last few years have seen the event take on a full entertainment package, with fans, teams and event organisers all raising the bar on fun and excitement. With Stetson hats and cowboy themed racing suits, Daniel Ricciardo in his Red Bull days enjoyed the fun so much he decided to do his interviews with an American accent, while the post race concert for all fans has been almost as big as the race, with stars such as Taylor Swift, Justin Timberlake, Britney Spears and Bruno Mars all headlining over the past few years. 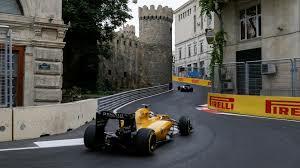 One of the newest destinations on the Formula 1 calendar, Baku made it’s debut during the 2016 season when the event was billed as the European Grand Prix, before officially being named the Azerbaijan Grand Prix from 2017. The second longest track on the calendar behind Spa, the track is a high speed street circuit with extremely tight corners and chicanes that wind through tho old town’s palaces and towers. In it’s short history Baku has been full of action, including Sebastian Vettel shunting Lewis Hamilton while under safety car in 2017, and Max Verstappen and Daniel Ricciardo’s Red Bull disaster when both drivers collided in 2018. The success of this event was rewarded at the start of this year with an extension to 2023. While the drivers often complain about the lack of opportunity for passing on the classic street circuit, don’t be fooled - this is one of the most coveted titles to win on the Formula 1 calendar. Steeped in history and set amongst the wealth, style and extravagance of the ritzy streets of Monte Carlo, this narrow, twisty 3.337km track puts the skills of the drivers to the test. The most famous race in Formula 1 is a fan’s delight, with historic moments an memories associated with every corner and track landmark. From the famous slow corner at the Fairmont Hairpin, the quick fly by past glamorous casino square, to the drive out of Portier and into the famous tunnel (replicated on Race Party’s Monaco race track) there are iconic points right across the track. Experience the thrills of racing in Monaco in miniature at Race Party. Want to try out your skills on our Albert Park and Monaco slot car racing tracks? You can book online, call (03) 9882 1391 or fill in the form below to find out how you can host your very own Race Party for your next birthday, corporate event or just with a group of your friends! Older PostSatisfy their need for speed at Race Party these holidays!